Grease a dish with unsalted butter and set aside. 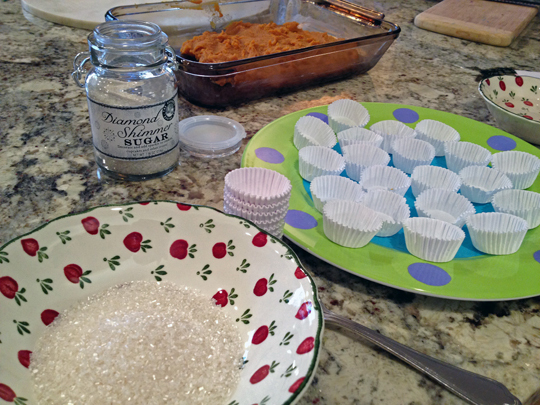 Place about 1 cup of granulated sugar on another plate and set aside. Mix the condensed milk, pumpkin puree, butter, and spices in a saucepan over medium heat. Non-stick is best. Cook, stirring constantly in order to avoid burning, until thickened enough that the bottom of the pan shows through briefly when the mixture is stirred, and runs to the sides of the pan slowly if gathered in the center of the pan with a wooden or plastic spoon– this should usually take approximately 10-12 minutes, depending on your stove. Remove from heat, stir in the vanilla, and pour mixture into the greased dish. Let cool. 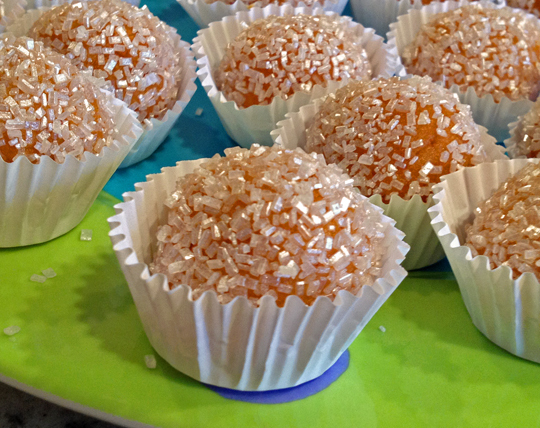 The brigadeiro dough can be refrigerated for about 20 minutes before rolling into balls if desired. 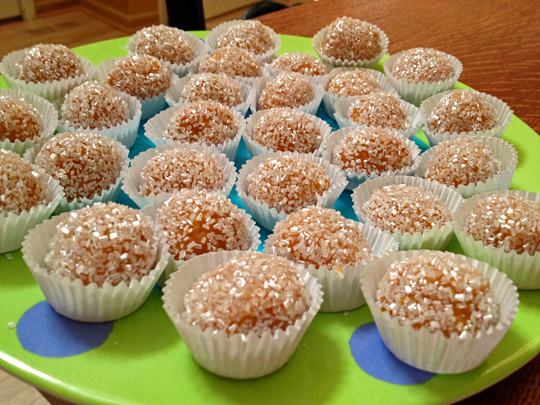 Then wet your hands with cold water and shape the brigadeiros into balls, using a tablespoon as measure. Roll each one in sugar, and place in small paper cups. Comments: This was a delightful take on a Brazilian classic! They are sweet with all the condensed milk, but the pumpkin offers a nice counterpart. I took a batch for a potluck dessert party, and lots of people asked me for the recipe, so I guarantee that whenever you make these babies, they will please your guests!